Health care is an ever-evolving field with constant changes both in the area of medical knowledge and in terms of health care as a business. Medicare began back in the 1960s and the concept of Medicare Advantage (“MA”) programs dates back to the mid-1990s and allows Medicare beneficiaries to choose a private company to provide their Medicare services. Both have seen changes, with Medicare Advantage undergoing significant changes in 2003 and significant growth in the past decade. Sadly, along with the growth has come the problem of Medicare Advantage fraud. Efforts to combat this fraud are also evolving and our Northern California Medicare fraud law firm is keeping a close eye on the important legal developments in this area. Each year, the Office of the Attorney General (“OIG”) for the Department of Health and Human Services (“HHS”) creates a list of the top management challenges that HHS is facing, a list that can point to some of the department’s key vulnerabilities. Item Six in the list of the Top Management & Performance Challenges for 2013 (released in December 2013, this appears to be the most recent list) is “Preventing Improper Payments and Fraud in Medicare Advantage.” According to the OIG, taxpayers lose billions of dollars because of improper payments to MA plans. In FY 2013, HHS identified a 9.5% error rate for MA plans which corresponds to an estimated $118 billion in improper payments including $9.3 billion in overpayments and $2.6 billion worth of underpayments. This includes both accidental errors and fraudulent transactions. Often, MA fraud relates to the risk-adjustment system. Each year, MA plans submit information about their beneficiaries to Medicare. The government program will pay the MA plans a monthly amount per beneficiary that is based on these health characteristics. Medicare pays MA plans more for sicker patients, such as those with a diabetes or cancer diagnosis, given the expected higher costs associated with providing health care to such individuals. As the OIG explains: “To calculate risk-adjustment payments, MA organizations submit beneficiaries’ clinical diagnoses to [Medicare]. 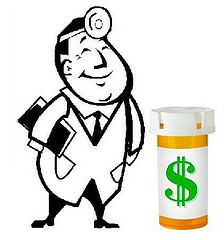 If a diagnosis submitted is not supported by the beneficiary’s medical record, the risk-adjustment will be inaccurate and result in payment errors.” It is not the only form of MA fraud (another involves payments from the MA plans to providers), but inaccurate risk-adjustment information is one of the main points at which MA fraud occurs. Currently, a qui tam lawsuit is pending against Humana, Inc. relating to MA payments. Dr. Olivia Graves filed the suit after allegedly noticing an unusually high number patients receiving unsupported diagnoses from a Humana clinic, diagnoses the suit alleges were made to boost reimbursement rates. In July, as detailed in a Law360 article, Humana filed a Motion to Dismiss based on the contention that the complaint does not allege the diagnoses resulting in an actual claim for payment. This is an issue because the False Claims Act requires a link between the fraud and the submission or payment of a wrongful claim. We are following the Humana litigation and other cases in this fast-developing arena. We believe that even if the Humana case is dismissed, cases based on similar frauds can be successful if properly framed. If you are aware of fraud involving an MA plan, including cases involving improper acts by plans themselves or by providers caring for MA patients, call our office to arrange a consultation with Gregory Brod. Attorney Brod is a California lawyer for Medicare Advantage fraud and is proud to partner with private whistleblowers throughout the state. Our firm is committed to protecting whistleblowers from retaliation and helping them recover the financial reward provided under the False Claims Act if the whistleblower’s knowledge helps the government recover wrongfully diverted funds.